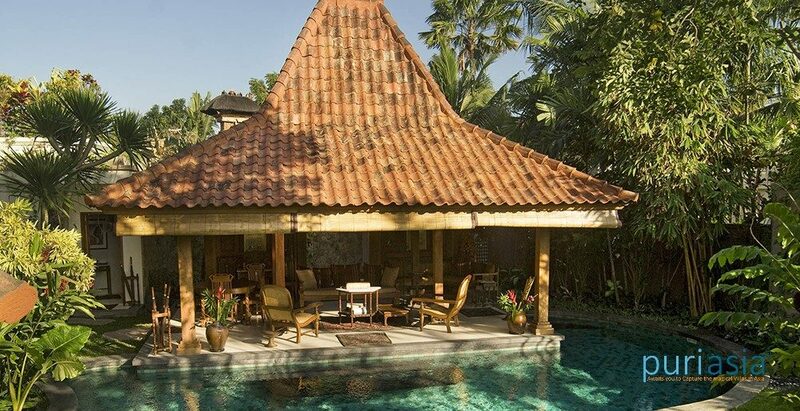 Distinguished by a historical Javanese ‘joglo’ living pavilion and contemporary-colonial architecture, the exquisite Villa Oost Indies presents three bedrooms, a swimming pool and huge gardens. Original colonial-style furnishings produced from indigenous teakwood and rattan by local craftsmen interpret Dutch designs, while reflecting the desires of the colonial era with lazy planter chairs, marble-topped tables and washstands, sumptuous silks, Chinese and Indonesian antiques, artefacts and curios. Here, in atmospheric luxury, guests can look forward to a captivating journey back through time, combined with the exemplary services of personal butlers and a top-class chef. Much of the antique timber from the century-old joglo – which was once the home of a Javanese nobleman – has been utilised, and can be seen throughout Villa Oost Indies in the form of wood-panelled screen walls and recycled teakwood floors. Yet the 21st century comes into its own with all the modern comforts, ranging from air-conditioning to flat screen TVs and DVD players in the bedrooms, steaming monsoon showers in the bathrooms, and the facilities of a fully-equipped high-tech kitchen. 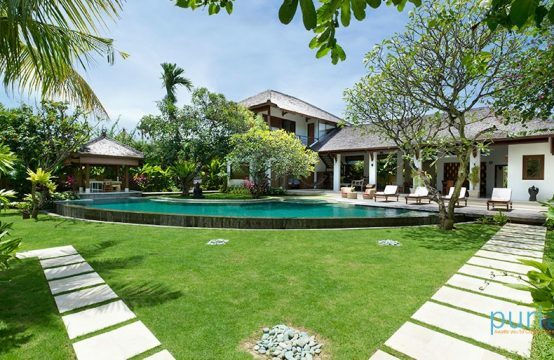 Villa Oost Indies is securely positioned just 400 metres from Petitenget Beach, Seminyak, and only a short stroll from a wide choice of internationally-acclaimed restaurants, beach clubs, spas, bars, shops and chic boutiques. 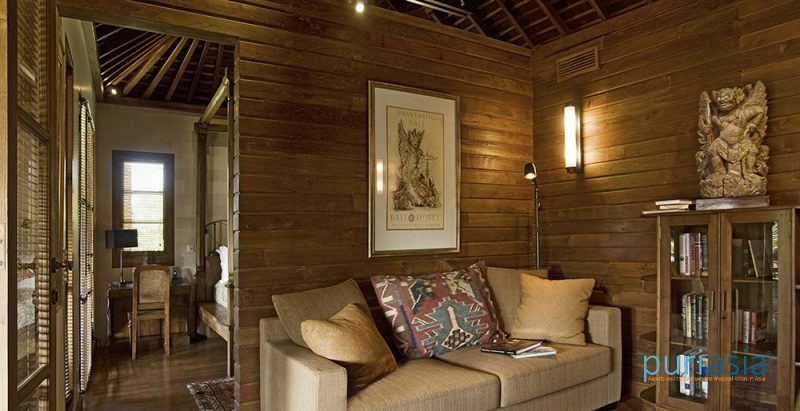 Situated on the upper and lower floors of the sleeping pavilion, and featuring private verandas, these two air-conditioned bedrooms (also fitted with ceiling fans) are identical in layout and design. 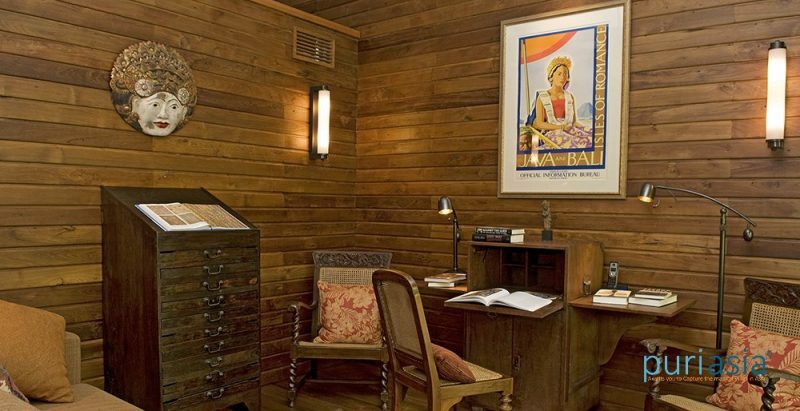 Both are furnished with four-poster king-sized beds, antiques, artwork and curios from Asia and equipped with. 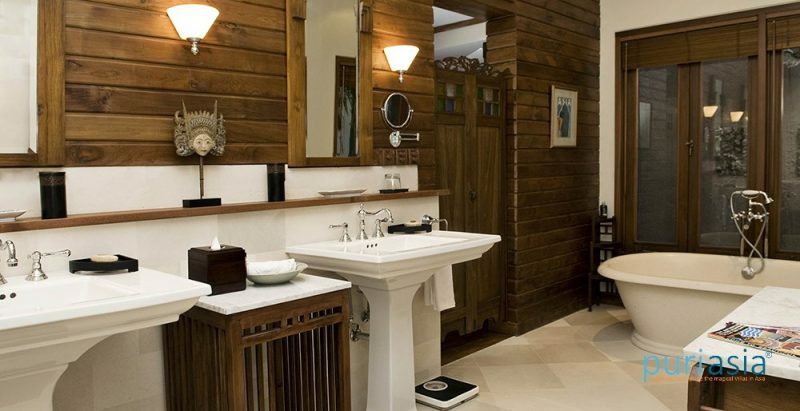 Expansive walk-through dressing rooms lead to large bathrooms tiled in smooth Palimanan stone, with his and hers vanities, antique wash-stands, rain showers and bathtubs. Private sitting rooms adjacent to the bedrooms are each furnished with a sofa (converts to a single bed), desk and second TV. A third large air-conditioned bedroom is located in a separate wing at the back of the property reached via a courtyard garden and with a private deck. Also equipped with LCD TV, DVD player and iPod dock, it is furnished with customised corner sofa, desk and king-sized bed that can be converted to twins. 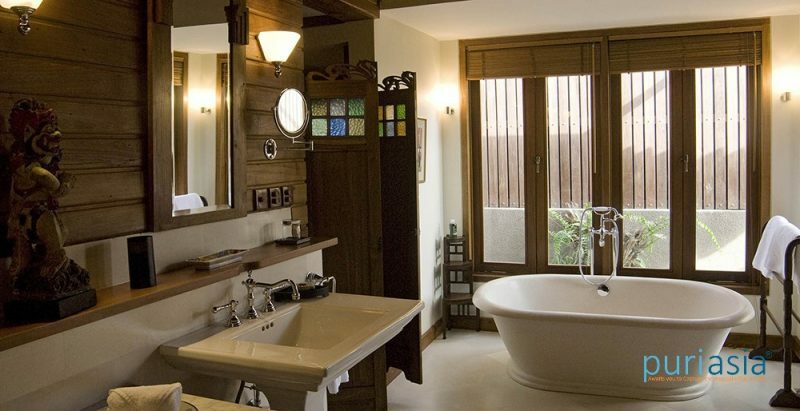 A spacious combined dressing room/bathroom has antique wardrobe and monsoon shower. 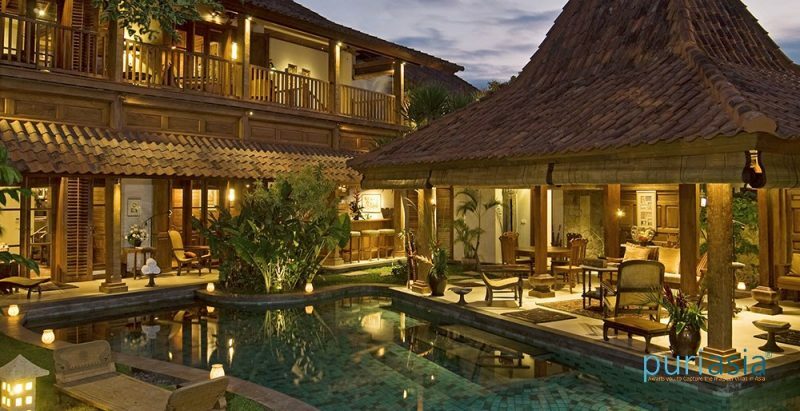 A beautiful, century–old Javanese joglo (traditional teak house) creates an atmospheric living and indoor dining area at Villa Oost Indies. The joglo is cooled by wooden ceiling fans and open on three sides to the lagoon-style pool that wraps around the building. A circular dining table seats eight, and a wooden sofa and rattan planters chairs are positioned to overlook the pool and garden. A teak-panelled bar nestles on the ground floor of the two-storey pavilion with five bar stools, a fridge and sink. From here, a door leads through to a well-equipped kitchen with black granite counters, oven, coffee maker and stunning antique side board brimming with crockery, ceramics and vintage silver tea pots. The villa’s eight-metre, lagoon-style pool flows around the joglo pavilion and is fringed by tropical plants at one end and an ancient frangipani at the other. 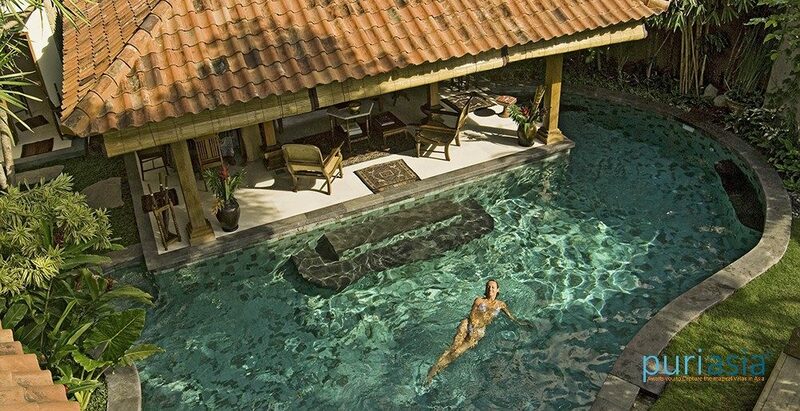 Beyond the pool lie manicured lawns bordered by tropical shrubs, bamboo and pandanus. Four deck chairs stretch out below sunbrellas amidst the trees and a rustic outdoor bench table for eight is set in a shady grove. Capacity for 6 people in 2 ensuite bedrooms with queen-size beds and 1 king-sized bed which can be converted to twins. An extra bed is available at additional charge. Living and dining pavilion with dining for 8; bar area; outdoor dining for 8. Villa manager; private chef; villa attendants; security, gardener. Additional staff (babysitters, masseuses) available on request. Satellite TV; DVD player; Bose speakers; iPod docks. 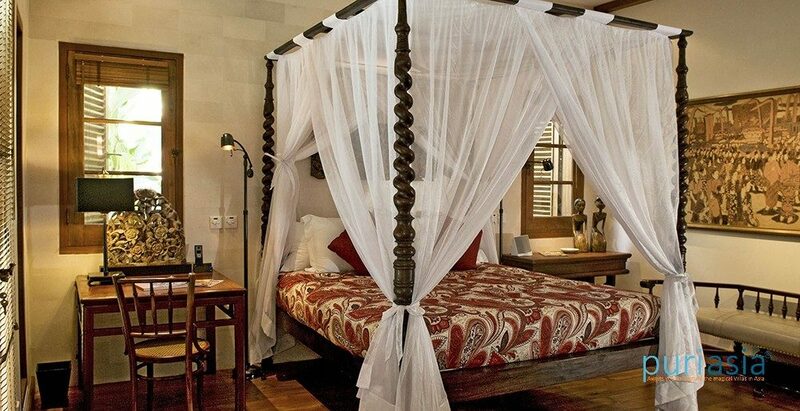 Villa Oost Indies is well-equipped for families. Facilities include a baby cot, high chair and inflatable pool toys. The villa’s central Seminyak location means that many attractions are within easy walking distance. If additional transport is required, don’t hesitate to ask the villa manager to call one of the island’s safe and reasonably priced metered taxis, or to organize day or half-day car and driver hire for sightseeing (additional cost). Barbecue; generator; safety deposit box.